Vibrant, colorful, these molas have been stored rolled since 1978. 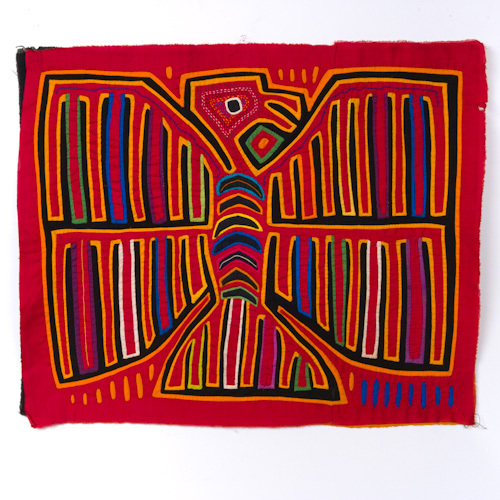 Two large, beautifully handmade molas from the Kunas of San Blas Island and Panama each depict a thunderbird, symbolic of the myriad raptors indigenous to Central and South America. They are both muliti-layer, with no less than 10 unique colors, all cotton, and handmade. 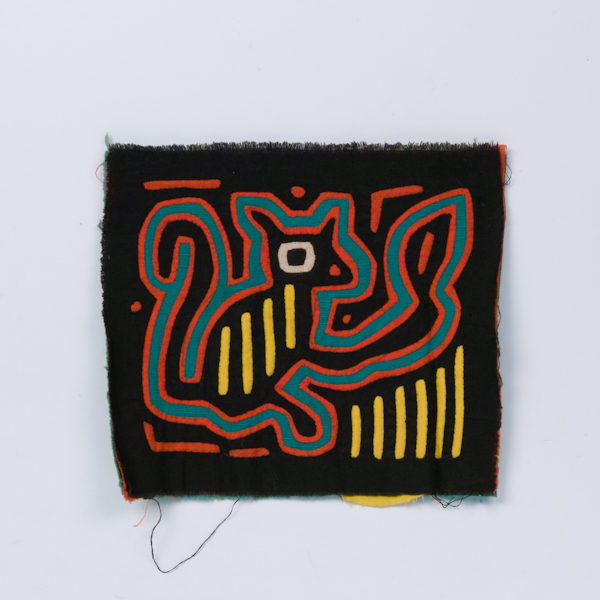 The provenance is known as these molas, as well as two I previously listed and sold, were bartered with a friend from Panama. He referred to them as “old,” in the 1970s. One of the two is so authentic one can see slight difference in the fabric, perhaps a water stain, in one area that was definitely in the fabric prior to the time at which it was sewn. Fewer and fewer molas are currently made in the traditional, labor intensive, one of a kind manner such as this pair, each 17″ high x 21″ wide with subtle differences again true to their one of a kind artisan characteristics. 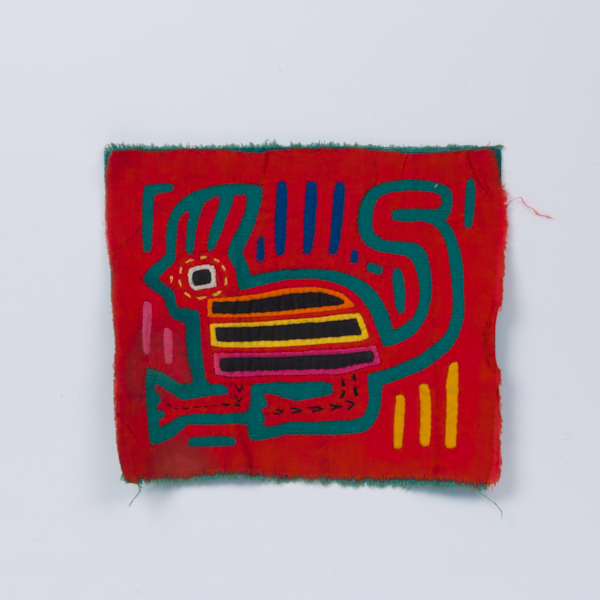 This colorful handmade mola from the Kunas of San Blas Island and Panama depicts a long tailed green iguana indigenous to Central and South America. 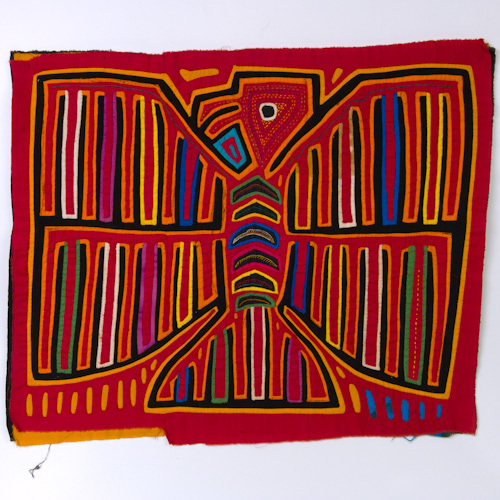 This sweet handmade mola from the Kunas of San Blas Island and Panama depicts a kinkajou, otherwise known as a honey bear, indigenous to Central and South America. The small three layered and four color all cotton handmade mola was bartered with a friend from Panama. He referred to it as “old,” in the 1970s. Fewer and fewer molas are currently made in the traditional, labor intensive, one of a kind manner such as this 8″ x 7″ piece.